PRODUCT: 3" DELUXE RETROFIT ALUMINUM ROOF DRAIN, WITH LOW PROFILE 14x14" DRAIN DOME AND 9" LONG X 3" DRAIN SIZE STEM, MADE BY OMG. DESCRIPTION: Constructed of aluminum & stainless steel for durability and designed for use with Single Ply, BUR & Modified Bitumen roofing systems. The patented OMG/RAC Backflow Compression Seal is compatible with PVC or cast iron leader pipes. 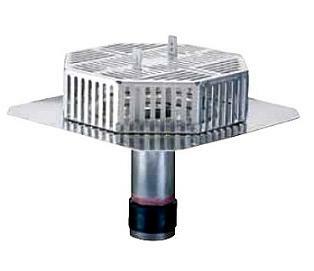 This drain features an extra large flange for positive attachment of the roof flashing membrane, a recessed metal clamping ring for roof termination and proper drainage, along with an oversized drain strainer to minimize damming. Available in 3", 4", 5", and 6" sizes with the low profile strainer dome or optional vandal resistant low-profile strainer dome (email for pricing). Pre-punched .080" thick with a large 18” x 18” aluminum drain flange. 14" diameter .080” thick aluminum drain strainer dome. Includes a .125” thick, aluminum clamping ring. Incorporates the patented RAC Backflow Compression Seal. Simple and easy to install from rooftop. OlyFlow RetroDrains are designed to replace existing drains in reroofing applications. Installed from the roof surface, the OlyFlow RetroDrains are engineered to be installed without removing the existing plumbing or fixture while providing a watertight connection to the roof system and the existing plumbing.